One of the great photojournalists died a week ago today. Leonard Freed, 77, died of complications of prostate cancer last Thursday, with his family by his side. Here's a link to a newspaper obituary, in this case the L.A. Times. 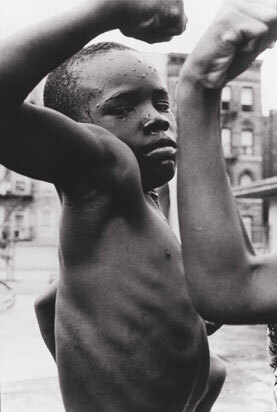 Leonard Freed makes me angry to be poor. He invited me once to come look at his work at his home, and of course I never did, for want of a plane ticket. And the last time I saw him he was selling his many amazing books—most of them out of print at the time—at one of the Photo East shows in the mid-'90s—a quiet man with a mass of curly silver hair, a card table with a white tablecloth on it, and decades worth of intense, nomadic observation of the world behind a series of nondescript covers. I couldn't afford any of them at the time. Both these things are good reasons to be a little more prosperous than I am. Leonard Freed was a member of Magnum for many years, before quitting abruptly I-don't-know-when. Magnum has put up a quiet but moving tribute to him and his work at Magnum in Motion. There's a large amount of his work available to be seen on the Magnum site, in the archives. It's better seen in books, but online is better than nothing. I think Leonard Freed was too keyed into the strangeness and savagery of life to ever allow his work to get pretty enough for mass consumption. Even among fans of street photography and photojournalism his work is still something of an acquired taste. He did take some really attractive pictures—the most famous is probably the fine shot of a couple of black kids in the spray of a fire hydrant, which could almost be a Doisneau—but his best pictures all contain completely individualistic elements of strangeness and awkwardness, complicated paintings of moments. And he worked naturally in terms of extended stories, pictures as impressions piling one upon another. Again, best seen in books. Thanks for posting this. This is one of the reasons for me to check your blog: to get updated on famous and not-so-famous photographers. I guess I should've heard of Freed. I hadn't. So thanks - to Mr. Freed for the images, and to Mr. Johnston for pointing me to them. Judging from the images, Freed had lived - really lived. I stumbled across Freed's work way back in the early 1970s, when I was still in high school. That grittiness, those odd, awkward gestures grabbed me, and still do. Mike, like you, I have regrets about people who left this world before I could spend some time with them. It's getting late. "You simply must tell me which book has the two kittens meeting in the street, simply titled '1958.'" That picture is in _Leonard Freed: Photographs 1954-1990_, first published in Paris, France by Les Editions Nathan in 199i, with a subsequent American edition published by Norton in 1992. I think (not sure) that it's the most recent of Freed's books, and should be the easiest to find (check abebooks.com) and the most affordable. The reproductions in the book are very good. I think a lot of the pictures featured in the Magnum in Motion tribute are in this book.